Case 26: In the photo below, W3571 is just getting his finish "beep". Does this mean he is now safe from any further starboard/port protest that Len (6732) may wish to lodge? Case 27: In the photo below, Marc (3854) is "sitting" near the line. Suppose he were to feel he was too close to the line and began to back up by pushing out his boom. 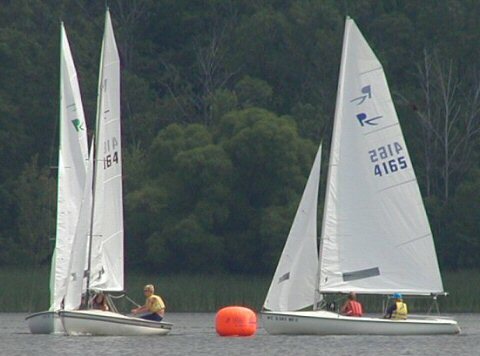 Would rule 12 (overtaking boat) still apply to boats approaching from astern of 3854? Why (not)? 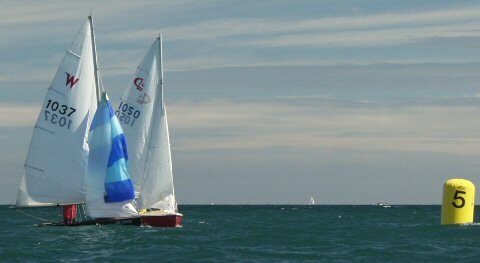 Case 28: In the photo below, Len (6732) and Robert (3571) were sailing close-hauled on port. Seeing Jens (7663) approaching on starboard, Len asked Robert for "room to tack" about 5 seconds ago. Was he entitled to do this? Why (not)? Case 29: In the photo below, the Wayfarer (l) is on his beat and meets these three Flying Scots. 1. Who has the right of way here? Why? 2. If there were a feud between W2415 and Scot 5020, could one deliberately "hunt" the other? Why (not)? 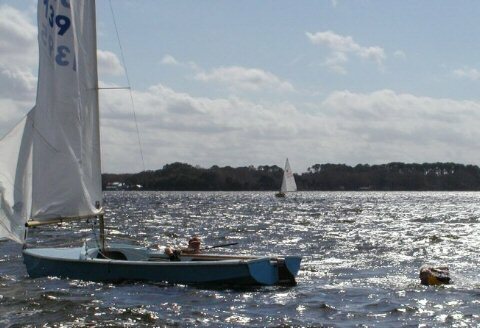 Case 30: In the photo below, you are sailing past this Wayfarer close-hauled on starboard. What do Rule 1 and maritime tradition require of you? 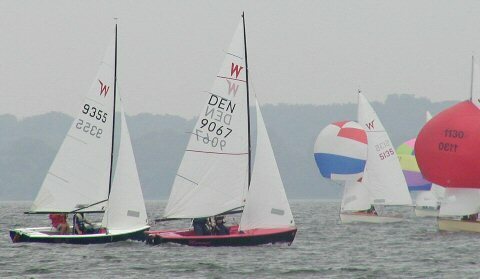 Case 31: In the photo below, W3568 is just getting his sails in after a somewhat sloppy rounding. If Geoff (W9483) had been ready to go higher sooner, would Geoff have legitimate grounds for a protest against 3568? Why (not)? Case 32: In the photo below, the red Wayfarer has hit the mark. Assume that he will now pass it on the required side. 1. What do the Rules require Peter to do to exonerate himself? 2. Under what circumstances would he have to retire instead of taking a Penalty? 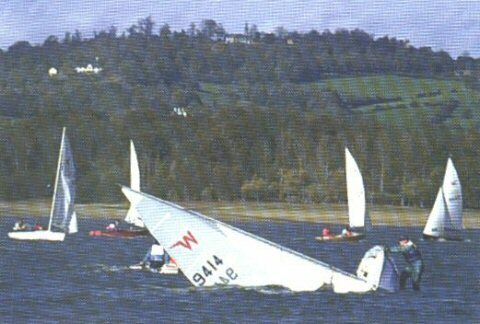 Case 33: In the photo below, assume that W9414 has capsized on port tack while racing. Does he still have to keep clear of right-of-way boats? Why (not)? 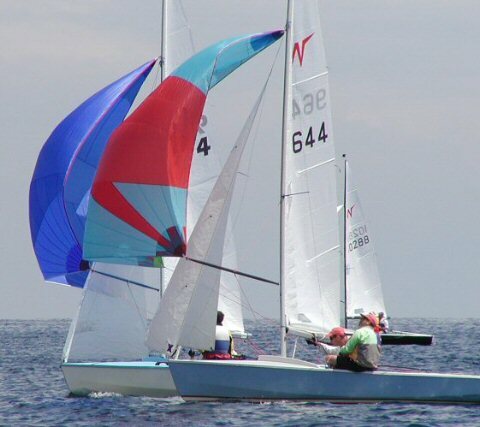 Case 34: In the photo below, Rob (CL1050) is approaching the leeward mark with an inside overlap on Kit (W1037). Is Rob entitled to enough room for a tactical (wide and close) rounding? Why (not)? Case 35: In the photo below, three minutes remain to the start signal. Suppose Dan (Rebel 4180) fouls Bruce (4187) a few seconds after this picture was taken. Does Dan have to wait until after the start signal to do his Penalty Turns? Why (not)? Case 36: In the photo below, Joel (W8278) and Mogens (4645) are about to pass astern of starboard tacker, Flemming (5797). 1. 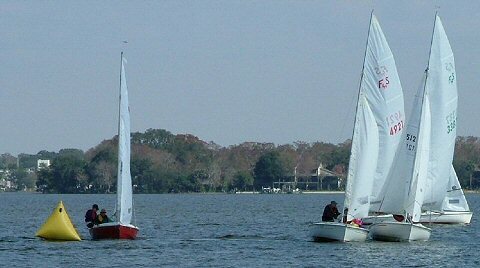 Can a right-of-way boat rank as an obstruction? 2. Would Mogens be entitled to ask for "room to tack" for 5797 here? 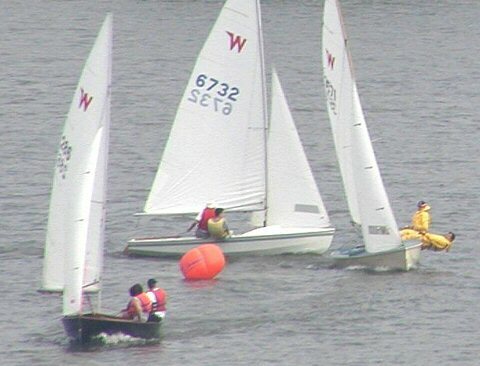 Case 37: In the photo below, Ted (W2415) has just begun a Two-Turns Penalty. 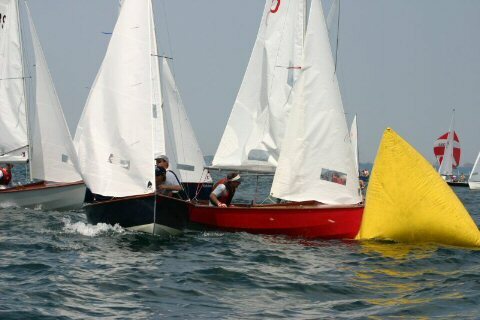 In addition to making two turns in the same direction, what two things does rule 44 require of Ted? Case 38: In the photo below, Robert (W10195) approaches Ted who is doing his turns. What is Robert not permitted to do here in regard to Ted? Case 39: In the photo below, Peter (W286) is just nearing the windward mark as Hans (938) and Dwight (4606) begin their run. Who has right of way in this situation? Why? 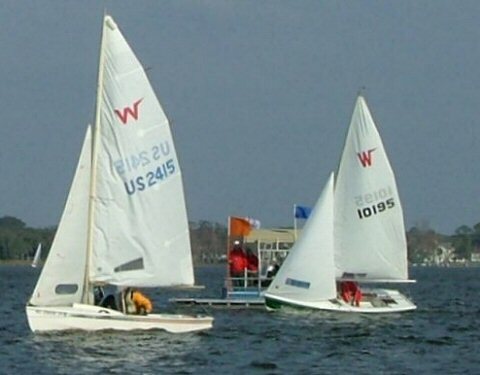 Case 40: In the photo below, Toby (l) has just finished 2nd in the final race of the 2004 Wayfarer Worlds, and is beginning a nice, relaxing run back to the Port Credit YC. 1. What rule of Part 2 of the RRS still affects him even though he is no longer racing? 2. Why might this rule be very costly to break? 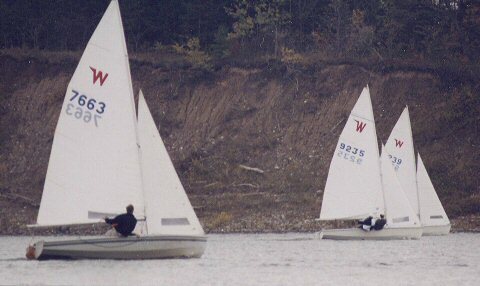 Case 41: In the photo below, Flying Scots 4921 and 3307 (r) collide as they round the leeward mark. Who has fouled whom here? Explain. Case 43: In the photo below, Rebel 4164 tacks to starboard right at the windward mark to be left to port and just in front of the Rebel already laying the mark on starboard (left). 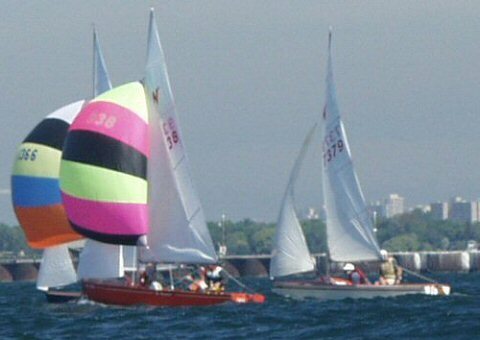 The latter is forced to luff up nearly head to wind in order to avoid a collision. 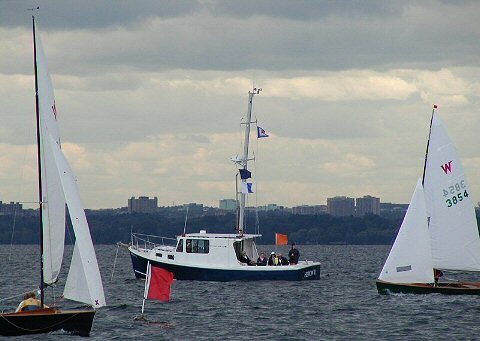 In addition to the obvious risk of infringing rule 13 (tacking too close), in what other way does 4164 foul the other boat here? 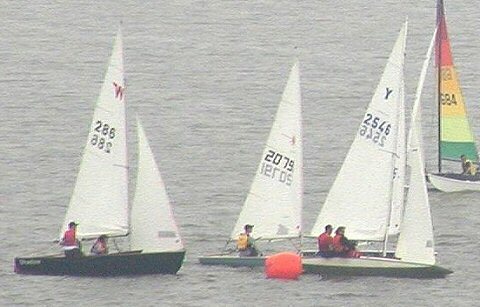 Case 44: In the photo below, Wayfarers 1366, 938 and 7379 are reaching towards the gybe mark. 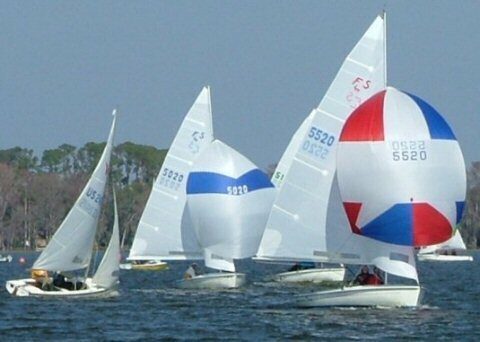 Hans (938) has overtaken Doug (1366) and Fred (7379) from clear astern. 1. What rule limits the course of W938 in relation to both 1366 and 7379? How? 2. 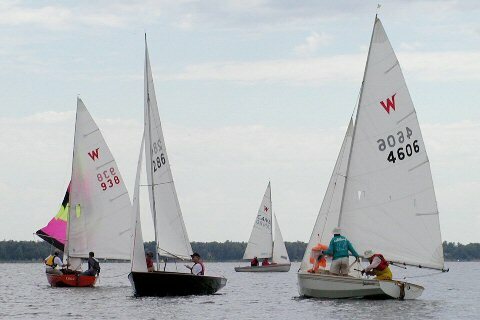 What rule limits the course of both W1366 and W7379 in relation to 938? How? 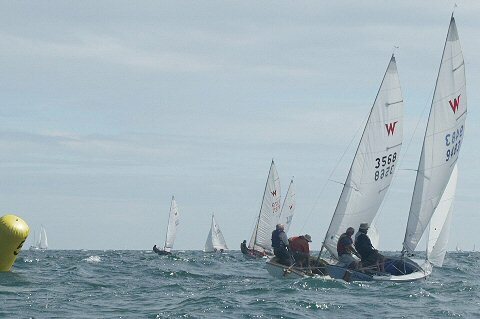 Case 45: In the photo below, the Flying Scots have just started their run when they meet the close-hauled Wayfarer. 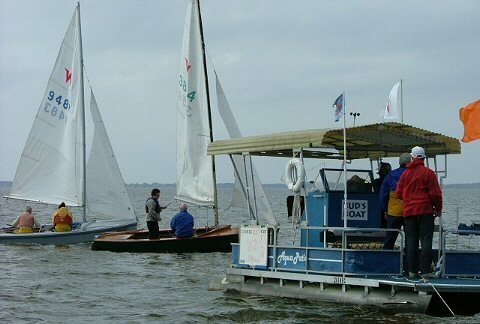 Which of these five boats has right of way over all the others? Explain. 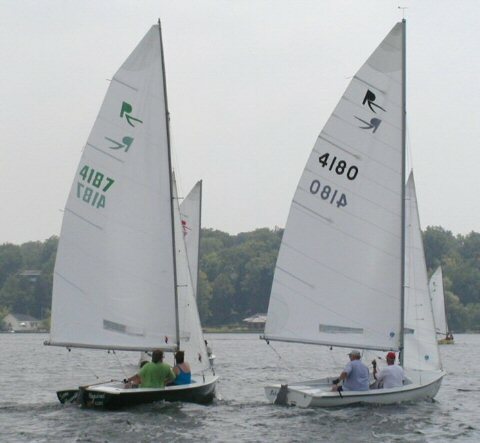 Case 46: In the photo below, it's a close finish among two Lasers, a Y-Flyer and a Wayfarer at the June Bug on Fanshawe Lake in London, Ontario. 1. Does rule 18 apply here? Explain. 2. What happens if 2546 gets his 'beep' but then hits the mark? Case 47: In the photo below, Al (W9355) and Sten (W9067) are approaching a mass of spinnakering Wayfarers in the 2002 DM on Furesøen. 1. What do the Rules basically require in this situation - of Al? of Sten? 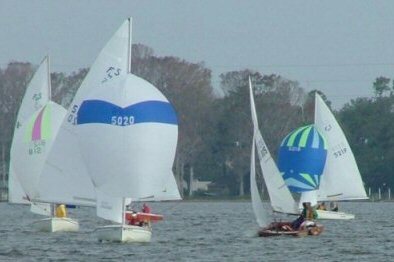 of the starboard boats? 2. Is Sten entitled to get "room to tack" from Al here? 3. 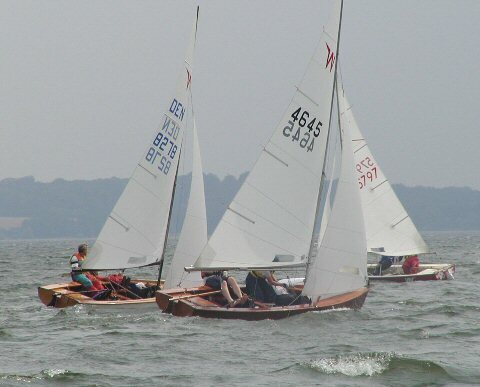 Is Al entitled to get "room" from Sten if Al should need to bear away to avoid a starboard tacker? Case 48: In the photo below, Brian (W9235) and Scott (W9239) are about half a boatlength apart and getting quite close to the lee shore. 1. Does Scott have to slow down and/or wait for Brian to tack away before tacking himself? 2. 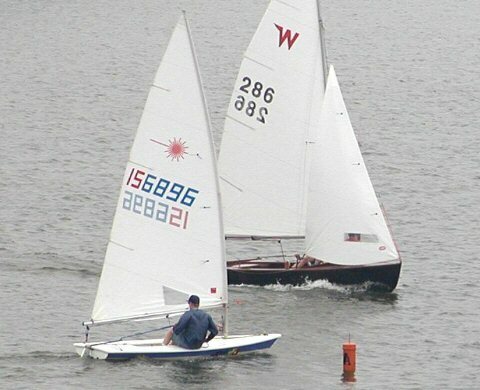 Could Brian (9235) legitimately ask Jens (7663, the third boat) for "room to tack" here? Why (not)? 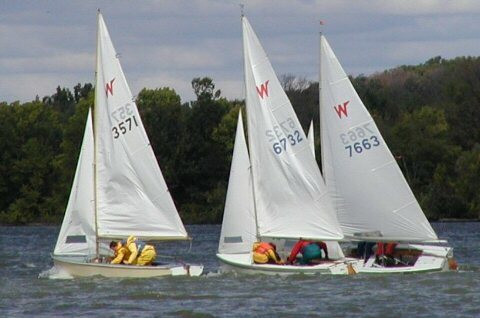 Case 49: In the photo below, Laser 156896 and Wayfarer 286 are about to round the windward mark to starboard. What does rule 18 have to say about this situation? Case 50: In the photo below, Neil (W9644) has come up from astern of Roger (9174). What limitations, if any, are there to Roger's right to luff and defend his wind?